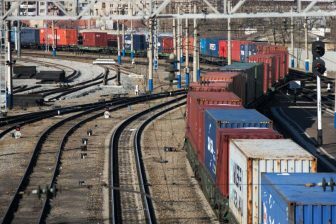 The New Silk Road has become an integral part of the Eurasian rail freight sector. 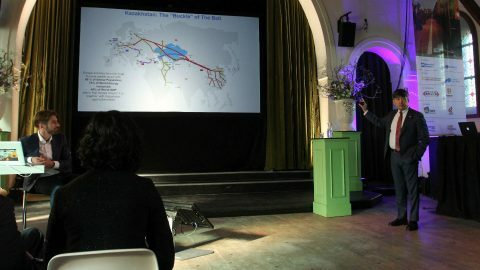 This became clear as experts from all over the world gathered in Tilburg, the Netherlands on 27 September to discuss the opportunities of the New Silk Road. 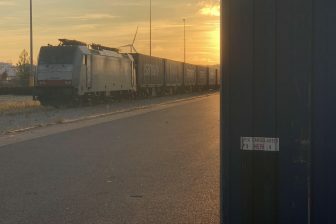 They revealed the latest investments, new routes and remaining bottle necks on the multimodal connection between Europe and China. Eight hours of interesting reports, intensive discussions, and useful meetings featured the conference, which was organised by RailFreight and Nieuwsblad Transport. It was held in Tilburg due to the importance of this city on the New Silk Road; Tilburg is a key railway hub on the Chengdu – Rotterdam Express and home to the first direct railway link between China and the Netherlands. Many stakeholders including shippers, logistics providers, lawyers, top managers and others from countries as the Netherlands, Poland, Russia and China shared their experience on and knowledge of the New Silk Road. The experts debated many topics – from customs rules to global shifts in transportation. However, the overall theme was the huge potential of the corridor, which is hard to understand without four key factors: geography, infrastructure investments, cross-border gates and alternative routes. The conference started with the presentation of Magzhan Ilyassov, Ambassador of Kazakhstan to the Netherlands. He started off talking about the effective use of Kazakhstan’s location that could be a good example to others. “Kazakhstan is the ninth largest country in the world, but we have many other advantages. The most important one is location. If you look at the map of New Silk Road, Kazakhstan is situated in the middle of it. When I am talking about location, I mean not only geography. It is more important that Kazakhstan is a bridge between two global markets – the European and Chinese ones. That is why we believe that Kazakhstan is truly the buckle of the Belt,” said the Ambassador. At the same time, Letty Zhu from Breda Applied Science University emphasised that the geography of China has a great impact on New Silk Road. She specified that the routes of block trains between the EU and China depend on regional features. 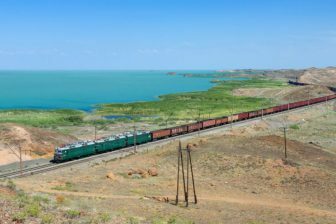 For example, the goods from the central-eastern part of the country are transported via Kazakhstan and Russia, while products from northern China only via Russia, via the Trans-Siberian railway. Zhu noted that European companies working in China should take into account geographic specifications of the country. “There are geographical barriers in China, various provinces are working quite differently, and they are not connected with each other. You need a certain time for the promotion of your goods, depending on the province,” explained Letty Zhu. Another factor of success on the New Silk Road is smart and well-designed infrastructure investments. “What has Kazakhstan done for the ‘Belt’ (Belt and Road inityiative)? It was ten years ago when we started to invest heavily in infrastructure development, several years before the BRI was launched. During these ten years, we invested 30 billion dollars (25.9 billion Euros) in the development of the country’s infrastructure. Smart people in the government understood that we should transform the country from being landlocked to land-linked. Therefore, Kazakhstan invested in building new railroads and reconstructing old ones, in constructing highways and increasing capacity of the Caspian seaports and airports. This has been a chance to develop as a hub,” said the Ambassador. According to Ilyassov, Kazakhstan built 2,500 kilometres of new railways as well as reconstructed 10,000 kilometres of old ones in the last ten years. From 2018 to 2020, Kazakhstan Railway intends to reconstruct an additional 4,400 kilometre of railway. “These figures show that we are really developing our infrastructure to interconnect the ‘Belt’. There is not so much construction on the north-south axis because this was already built in Soviet times. But the east-west route had not been developed, therefore a lot of money is now spent to develop this link”, resumed the Ambassador. Investments in rail and road infrastructure are not a panacea in developing freight transportation on the New Silk Road. It is impossible without effective cross-border gates. Currently, the main loading and unloading operations on the route between China and the EU take place on two borders – the Chinese/Kazakh and Belarusian/Polish ones. Ten years ago, when block trains from China made their first trips to Europe the only gate to Kazakhstan was Dostyk, with a capacity of 760 TEUs per day. Due to growing freight volumes on the route,, Kazakhstan decided to build another cross-border terminal. Thus, Khorgos Gateway was launched in October 2016. The capacity of the new facility is much higher than that of the Dostyk terminal – 5,000 TEUs per day. Besides an intermodal terminal, Khorgos Gateway houses logistic and industrial areas. At the same time, the European cross-border gate needs the same expansion. Now, the Brest/Malaszewicze crossing on the Belarussian-Polish border works at almost full capacity. According to Andrzej Banucha, deputy director of promotion & investor relations department of PKP Cargo, the number of freight trains from Belarus to Poland are increasing constantly, and this year rose from nine to thirteen per day. The repair works on the Polish railway network complicate the situation. As a result, there are some delays in container transportation. However, a second bridge across the Bug River is under construction to extend the Malaszewicze facility. Nevertheless, transport companies are looking for new, alternative routes. There are several options for different geographic and operational purposes. For example, several new connections between Belarus and Poland have been launched during the last two years, bypassing the Brest/Malaszewicze cross-border gate. Last year the Chengdu – Lodz train ran via the Bruzgi/Kuznica border point. Another initiative was launched this May, when UTLC started regular train service from Chongqing to Kaliningrad. “The Kaliningrad route allows for two options. The first one is a land connection to Poland. The second one is a multimodal solution through the ports of the Baltic Sea. This option opens the new possibility of delivering freight by sea to Hamburg, Rostock. This is how we see the near future of the project,” said Vladimir Remizovich, project manager of UTLC. Alternative routes are being established on other parts of the New Silk Road. Thus, Mongolia became involved in container transportation between China and EU. Moreover, Kazakhstan on its territory is also developing several routes. “In my opinion, all these routes are complimentary. Some of them are cheaper; some of them are longer, etc. But considering the growing capacity of Chinese manufacture, I think all routes will be used,” noted Ilyassov.